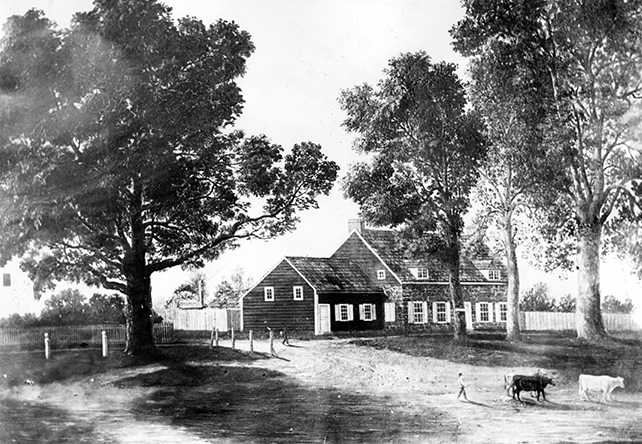 Nathaniel Camp House on Broad street, where Washington came to dinner in 1779 and 80. Newark's earliest history is marked by visits and contacts of famous people. The best-known visitor was GeorgeWashington, who came to town on several occasions to take charge of the Continental troops in 1775. He returned during the winter retreat of 1776 and also made several military forays here in 1779-80. Washington's first trip to Newark took place on June 24, 1775 when the future commander-in-chief stopped off on his way to Cambridge. The general is thought to have stayed at the Eagle Tavern at Broad and William streets. Upon leaving, his party moved north along Broad Street, turning east onto Market before proceeding down Ferry Street to cross the Passaic River on the way into the meadows.From there, the party headed east to Hoboken and crossed the Hudson River at a point designated to protect Washington from possible British capture. Seventeen months later Washington was back in town for a second visit, but the mood of this trip was entirely different. No longer excited over the possibility of victory, his fortunes seemed exhausted. Now he was in retreat. His army was in rags, his men hungry. British agents promised Crown pardons, and his second-in-command, Major Gen. Charles Lee, was not supporting him. Indeed, to many it appeared that Lee was actually conspiring to damage Washington's reputation for his own personal gain. With military reverses at White Plains, Washington's New Jersey retreat took on many aspects of defeat. After entering New Jersey in Bergen County, Washington's troops moved south from Hackensack, crossing the Passaic River bridge at Acuackanonck (modern-day Passaic). Once they were safely across the narrow wooden structure, it was dismantled. Two of Washington's divisions then were sent westward to modern-day Montclair and Glen Ridge, and the third accompanied him to Newark. The location of the general's 1776 Newark headquarters has been disputed. Some think he stayed at Cockloft Hall on Mt. Pleasant Avenue. Others believe he moved to the Coe house near the present-day Star-Ledger building. Still others argue that he took up residence at the Eagle Tavern. Accounts of old-time Newarkers favor the last location. In the meantime, Washington's soldiers camped along High Street and were billeted in their homes. Newarkers were noted for their hospitality, and on more than one occasion Washington was treated to ham and eggs. The hostess hoped that seconds were not requested because in most cases there were none. The depression and gloom which marked Washington's five-day visit was best summed up by Thomas Paine, who is credited with having written The American Crisis, while here in Newark. It includes the famous line, 'These are the times that try men's souls.' Fearing the continued advance of General Cornwallis from Belleville on the north, Washington withdrew his troops from the Orange Mountains. Receiving little help from General Lee, he continued his famous march south to the Delaware and eventually won victory there at Christmas. No sooner had Washington retreated, then British forces occupied old Newark-town. Washington's third encounter with Newark occurred during the winter of 1779-80 while he was staying at Morristown. On several occasions he attended meetings of St. John's Lodge and dined at the home of Capt. Nathaniel Camp. In spite of the social nature of these visits, Washington considered them fact-finding activities. Washington's death in 1799 brought the final chapter in the relationship between the city and the general. Notice of his death was met at the Essex County Courthouse by a resolution for residents to wear black crepe arm bands, the tolling of bells, and funeral orations by churches and Masonic lodges. The following year, Feb. 22, the date on which he was born, was proclaimed a citywide day of mourning. So ended Newark's first-hand relationship with a national hero, the father of the country.